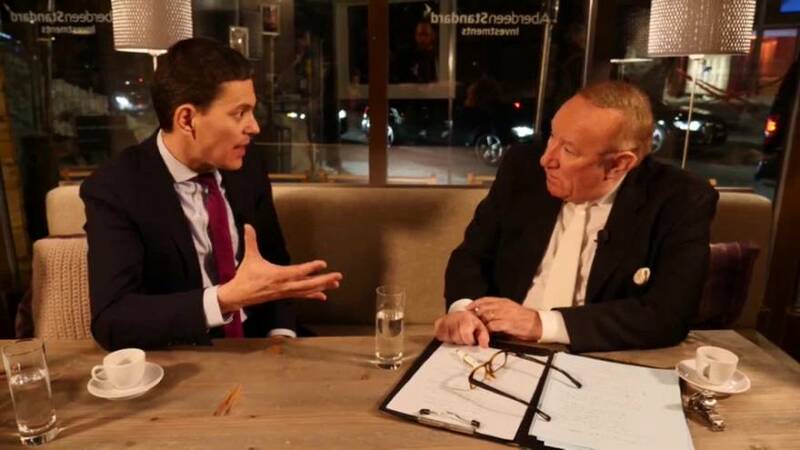 In an exclusive 'Euronews Uncut' interview, top political commentator and journalist Andrew Neil grills former UK Foreign Secretary David Miliband during the World Economic Forum in Davos. Beginning with the decline of mainstream European political parties, Miliband cited two main reasons. "The first is that it is a victim of its successes in that the period of post prosperity the 70 years after the Second World War narrowed some of the differences between right and left. And secondly it's evidently the victim of its failures the most obvious failure being the financial crisis which exposed how in an interconnected world you're only as strong as the weakest link and the weakest link hadn't been tended to," he said. Neil asserts that, for most people "average wages in real terms have been stagnant since the crash, not increased in real terms. The 12 richest people who come to Davos are now a hundred and seventy five billion dollars richer than they were ten years ago, and the social democratic, your, side of the political debate has nothing to say." Miliband, who is also President of the global humanitarian aid NGO the International Rescue Committee, made the link to migration. "Let's be honest about it that the way in which migration interlinks with issues of stagnant or falling wages is a big part of this story. The Swedish story I think is an interesting one where many Swedes… feel that they have borne a disproportionate share of the European load when it comes to the migration issue. What that says to me, and I run an NGO that works in Lebanon Jordan with refugees amongst other places, we were warning in 2012, 2013, 2014 that there was an explosion coming, that those countries couldn't contain the five million refugees who'd come out of Syria. And the lesson is not that every country should be doing its own thing - Europe didn't get its act together in advance of 2015 when one, one and a half million people arrived on the continent. That's how you ended up with eight European countries opting out of the common scheme." Where are the centre left? Neil went on the attack with the level of genuine care the centre left has for it's voters. "The kind of people who traditionally voted for your sort of party. Just think you're not really interested in them anymore. There's a kind of metropolitan socialism which the Labour Party in Britain or others are interested in…people struggling on two wages. They feel that globalisation is good for people like you and people like me as well but not good for people like them it makes the labour market more difficult and you've just kind of passed them by." "I don't accept that and I neither accept that they have turned against us because they're still actually electing Labour MPs in the places that I represented. And secondly I don't accept that we have turned our back on them. What we are fronting up is that the choice is either you make globalisation fairer or it won't continue or you end up retrenching…the argument about Brexit in the end is whether or not Europe supports lower or middle income Britain or undermines it - my argument is that it's there to support it. And I think it's very, very important that we are we front up that argument. I do not see any answer at all for the people that you focus this interview on in putting up the shutters because actually it offers zero on investment zero on jobs, zero on wages." Neil asserted that the populist right "only have about 23 percent of the European Parliament at the moment." "Almost everywhere I look they're going to get a lot more than that - they won't get a majority - and that's in the context of a eurozone that is growing, that has at last shoved off the crisis of the eurozone and it started to see more jobs being created and economic growth…but that could be coming to a halt. I would suggest to you that not only is the picture still bad at the moment, if the eurozone was to tilt back into recession the picture would be horrendous," he added. Miliband said he and many others have criticised the mix of policies that exist in contemporary states. "We've always said that austerity plus reform is not going to deliver either the political sustainability or the economic benefits, you've got to be in a pro-growth pro reform mindset. And what Europe, the Eurozone area and not those countries that are not in the euro, but the eurozone has been trapped in a low growth cycle because, I would argue, it's had the reform but it hasn't had the growth policy. And the macroeconomic stance has locked Europe the eurozone into reliance on Mario Draghi and the ECB… and in the end he'll continue to play that role but it's not enough. You've got to bring the fiscal policy into play because otherwise you're not going to rebalance the European economy." As the 20 minute time limit hovered over the proceedings, Miliband predicted that the European elections will deliver "a resounding pro-European majority in Poland." "The worst thing we could do is pretend that the answers do exist, but the second worst thing is to write off the European mainstream as having no way of meeting the needs of its population," he added.